A Little About My Mama. My mama was young when I was concieved. She had hardly any of the typical problems associated with pregnancy. Until she started to feel "kind of bad". Her mama took us to the doctor, who said to stay in bed and keep her surroundings quiet. Later, while she was in bed, she called her mama and asked her to rub her head. Her mama knew something was wrong and rushed over. My mama could not see and her body was twitching. The pain in her head was unbearable, like a full blown migraine. The nurses knew that something was very wrong and called the doctor right away. Her blood pressure was 240/160, and she could not see anything. They gave her lots of shots that hurt bad and left bad bruises. After a while, she could see blurry images, buts thats all. My mama's doctor thought that she would recieve better care at a hospital that had more experience with pre-eclampsia. So, they put her in an ambulance and sent her to the new hospital. When she arrived at the new hospital, she could see a little better, although things were still blurry. A doctor told her that she had to have an emergency c-section or she would die for certain. My mama was worried about me, and the doctor told her that if she died that I might die too. So, mama had the surgery hoping and praying that we would both live. After the surgery, the neonatologist told my mama that I was big and healthy for a 31 week preemie, and they thought that I would do just fine. After that, they had to take my mama to ICU because her blood pressure had started to rise again to dangerous levels. She only stayed there for about 6 hours. When she came back, the neonatologist told my mama that there was a hole in my heart, but that it should close real soon. Mama Comes To Visit Me! They finally were able to bring my mama to see me. She kissed me and held my hand. I remember her saying that I looked just like her when she was a baby. She asked if she could hold me. She could not because the doctors had put me on a drug that paralyzed me so that all of my strength would go towards healing. But that did not stop her from holding my hand every time she came. My mama's room was on a different floor than the NICU. She had to sneak past her nurses to be able to visit me. They tried to keep her from doing to much because she was still very sick from her real high blood pressure. One time, she got very tired on the way back, and a stranger had to hold her while another stranger ran to get a wheelchair. But she did not care as long as she got to be with me. My mama loved me very much. Because the doctors had told my mama that I might not make it, she had me Christened right there in the NICU. It only took about 20 minutes after she asked before they had someone there to Christen me. While my mama was at home, I got sicker because the hole in my heart did not close like it was supposed to. They would not let my mama come to see me so she could hold my hand and kiss me. I guess they were afraid that she would get high blood pressure and might have a stroke. She was very sad that she couldn't see me. Her mama, my grandma, was with her when they called to say that I had gone to Heaven. 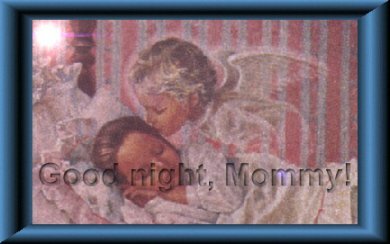 My mama cried and cried and her mama made her take some pain medicine so that she would sleep and not have a stroke. My mama never got to hold me. I am waiting for her in Heaven, waiting for my first hug from my mama. All The Sick Little Babies In NICU.